My aunt and uncle have found a way to creatively channel one of the more notorious childish impulses (drawing on the walls) into something fun and acceptable to parents. They designated a lesser-used area of their basement as a graffiti room. My little cousin is free to draw, paint, and glue on the walls to her heart's content. Do you have a room/ part of a wall in a basement, attic, garage or shed that might provide hours of decorating fun? Maybe you even have some leftover paint (hopefully with non-toxic fumes) from a room you painted long ago that you don't need anymore. 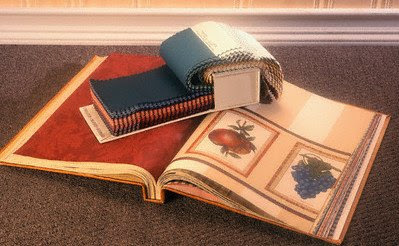 Paint stores often have old wallpaper and upholstery sample books that they don't need anymore. We had a couple growing up that we used for all kinds of crafts. Provide lots of materials and then let their daydreaming take over as you leave them alone to work out their visions. Then, of course, they will want to give you the tour!